To refinance or not refinance, is it worth the time? There are several situations in which it may be beneficial to refinance your vehicle loan. Are interest rates lower now than when you purchased your vehicle? If so, refinancing will lower your payment, but most importantly, it will decrease the amount of interest you have to pay on the loan. Has your credit situation has improved compared to when you bought the car? If your credit has improved enough, your interest rate is likely to go down. That means you’ll make a lower monthly payment and you’ll pay out less money in interest. Have you had major change in your financial situation? For instance, if you’ve earned a promotion at work or a new job that pays better than before, you may want to consider refinancing your long-term car loan to a shorter term. Your payments will be higher, but you’ll pay the car off sooner, and you’ll pay less money over time in interest. Are you unhappy with your current lender or their services? Perhaps their customer service isn’t what you expect. Maybe they are out of the area and hard to get ahold of. Or, you are just tired of talking to a machine instead of a person. 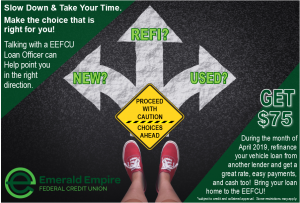 All of these are great reasons to bring your loan back to the EEFCU. Talk with one of our loan officers and see if what we can offer is better than what you currently have. We bet it is. And, during the month of April 2019, if you decide to refinance with us, we will give you a $75 as a Thank You! What have you got to lose? Nothing but a few moments of your time. But you chance to gain a better rate, friendly service, and $75 cash.